The poodle dog senses are sight, taste, sound, smell and touch. 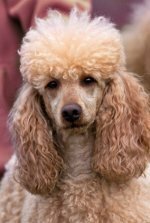 The poodle has been said to have an almost human intelligence. They are very smart dogs, eager learners, quick learners and have a great sense of humor. Like all dogs, their senses of sound and smell are much higher than the human capacity to hear and smell. Dog senses are much more heightened than ours. They can hear more sounds than we can, and their sense of smell is way beyond ours. If your dog hides during thunderstorms, that's because her sense of sound makes thunder sound 10 times louder to her than to us. A poodle's eyesight can see pretty far distances but their up close vision isn't as great as us humans. They can distinguish a few colors but do not have the color range that we have. They can see better in dim light, and in the darkness their eyes adjust better than their owners. Although your poodle may like to eat and taste everything he's hoping you'll feed him, they don't have a lot of taste buds like we do. Her sense of smell is very keen, though, and the smell of delicious food and desserts cooking or sitting on the table sends them begging for a bite or two. They will eat a variety of foods. Our dog refused to eat dog food, so we boiled a lot of low fat hamburgers for her to eat. 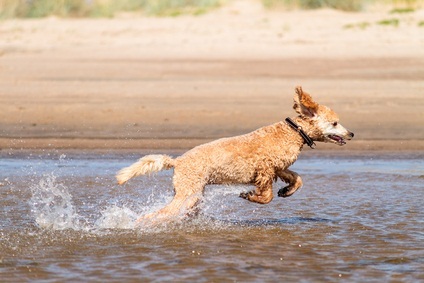 That's not recommended for all poodles, though, as they need to have a variety of foods in their diet so they receive the proper nutrition that they need, avoid dog food allergies and poodle health problems. Your dog will eat fruits, vegetables and meat, but it's important to monitor the amount of food they eat. Overweight dogs should be avoided at all costs, mainly for health reasons. Our dog loved a tuna casserole we used to make with peas in it, but she always managed to eat everything except the peas. They would all be lined up along her dish when she was done! Poodles can hear sounds and noises a lot better than we can. They can hear about 4x better than their owners which is why loud sounds like thunder and firecrackers can really scare them. Holly used to hide under the bed whenever a thunderstorm came through and would be shaking very badly until the storm was over. Poodles love to smell! Holly would smell everything in sight when she walked up to the mailbox with my mom. She also could smell her favorite foods being cooked from a good distance away. Like their sense of hearing, their sense of smell is much greater than ours. They can smell things we would never notice. They are very social animals and love to be with their pack, you! Touch is probably one of the most important dog senses for the poodle. They love being petted and rubbed, Holly always loved to have her belly rubbed. They're also very cuddly and love to lay on your lap when you're sitting in a chair and snuggle against you when you're in bed or on the couch. 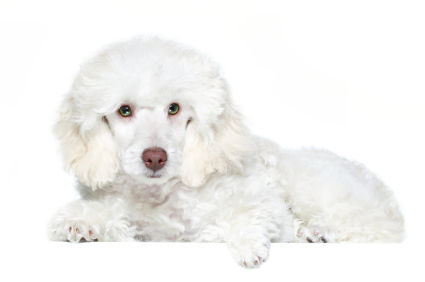 Enjoy your poodle, the togetherness and the companionship with a pet who's almost human! At least they think they are!